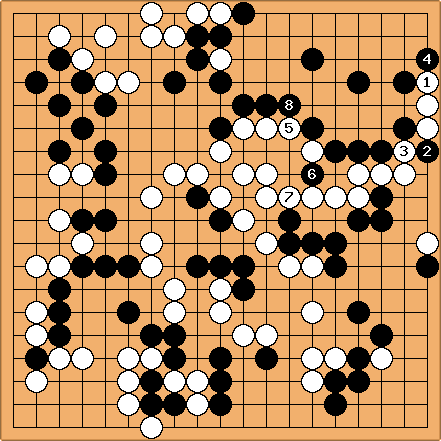 The correct White response to depends on whether there is a white stone at a or not. If not, c (or sometimes d) is usually the correct response, and if there is, b is the first move you should think of. If there is no white stone at a, the monkey jump is about 10 points in sente, while if there is a stone at a, it is the regular 8 points in sente. WTD: In 'Monkey Jump Workshop' by Richard Hunter, c is generally dismissed as a reply to the jump, because it loses points unnecessarily. I don't think it should be considered unless special circumstances apply, such as the invader exploiting a gap in the defenders formation, or forming a separate live group. axd: so the diagram 'Correct sequence' above, which says 'c' is the correct reply, is then no more than a "special circumstance"? Bill: I am far from sure, but e might be right. It's complicated. Anyway, e is one of the standard responses. Bill: See real game example. You should try to read out the answer precisely, as you should neither give up two points, nor lose the game by producing one of the catastrophic failures we have seen above. Try out your reading in the Monkey Jump Problem Series. 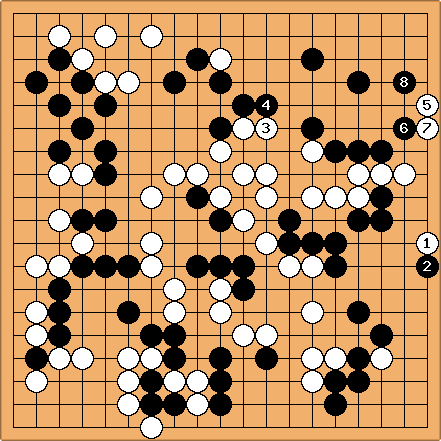 WTD: If is played at e, in '10 point monkey jump' (above), the result is 2 points better for White. This can also be achieved if White replies to the monkey jump at here (d in 'Defense summary'). 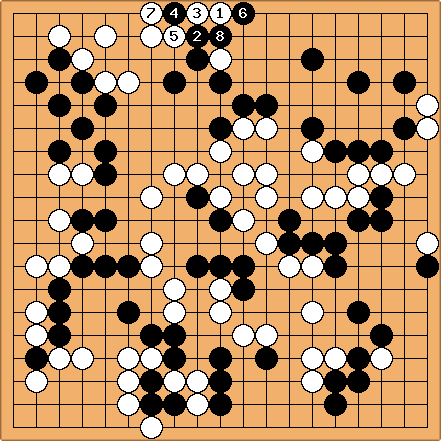 kl: it is because white could then play 3. Black cannot survive during the subsequent fight with fewer "breath". It comes down to whether Black can capture or not. With the squared white stone, is safe. 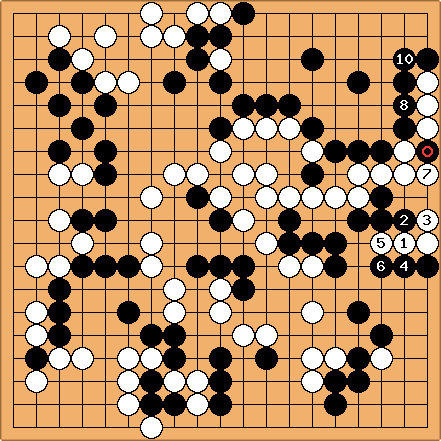 In this case, the first line block is half a point better, so long as Black can't play at b. In this game there are three monkey jumps, each answered in a different way.